Christmas came early for two Intertops Casino players that had incredible winning streaks the other night. Alan N. won over $70K on the car race-themed Dream Run and John F. hit a $15K progressive playing the holiday classic, Naughty or Nice. 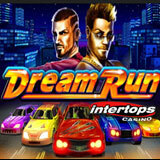 Alan N. got 5 of Dream Run’s “Pit Girl” symbols and won $37,500 on one spin. And then he had another amazing streak playing Rain Dance where his winnings totaled an additional $36K. He says he's going to get himself to a big flat screen TV. Meanwhile, John F. hit the SD progressive playing Naughty or Nice and won $15,849 on one $2 bet. His advice to slots players is to be persistent. “If you want to win at this game you just have to keep at it,” he advises.